Water Helps Reduce Risk Of Recurring Urinary Tract Infection : Shots - Health News While it may seem simple, drinking water flushes bacteria out of the urethra, helping to prevent infection in women prone to them. And it also may help reduce the use of antibiotics. The old advice seems to hold true: Drinking lots of water helps prevent urinary tract infections. Urinary tract infections cause painful urination and are unfortunately widespread. Scientists estimate that somewhere between 40 percent to more than 50 percent of women will get a UTI in their lifetime, and one in four will get a repeat infection. Left untreated, they can lead to kidney problems. Cranberry juice is a common at-home preventative measure, but the science behind relying on the bitter fruit is pretty mixed. Some research has shown evidence that compounds in cranberries could help prevent bacteria from infecting the urinary tract lining, but other studies concluded that the juice didn't help people with recurring bladder infections. But, there may be a simple, old, and drug-free way to reduce these infections: Drink more water — a lot more water. A study presented at IDWeek earlier this month in San Diego, an annual meeting of infectious disease professionals, suggests that drinking more water is pretty effective at reducing bladder infections in women who are prone to them. And it also resulted in doctors issuing 47 percent fewer prescriptions for antibiotics in these women. The research was funded by Danone Research. Danone also sells bottled water, like Evian, but Dr. Thomas Hooton, the lead author of the study and the clinical director of the Division of Infectious Diseases at the University of Miami, says that the study's conclusions are not exclusive to Danone's water. 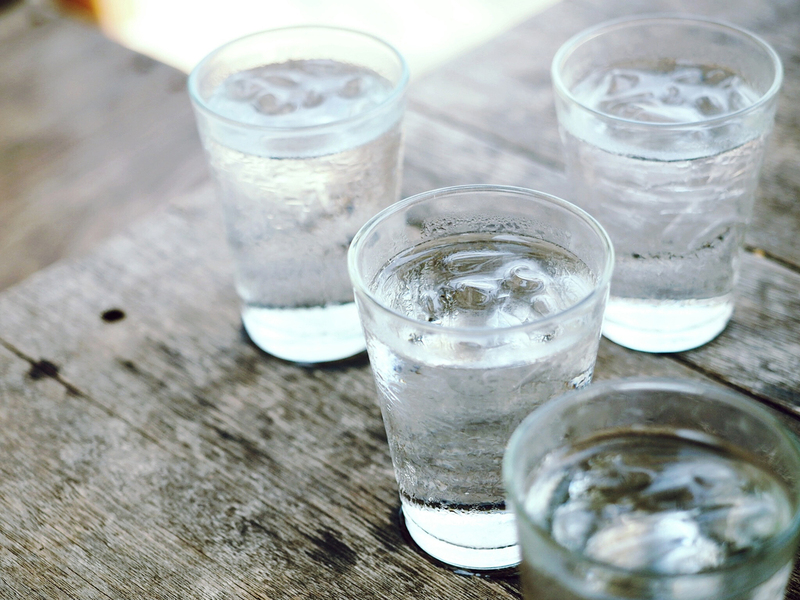 The study specifically looked at 140 premenopausal women in Bulgaria with recurring urinary tract infections, defined as more than three in the previous year, who drank less than a liter and a half of water (about six cups) each day. For an entire year, half the participants upped their daily water intake by one and a half liters, while the other half didn't change their water intake. The women who drank more water cut their UTI rates nearly in half — getting an average of 1.6 infections versus the control group's 3.1 infections. The research has not yet been submitted for publication. The idea of drinking more water to prevent UTIs doesn't come as a shock to doctors — it's common advice. Dr. Anthony Schaeffer, a Northwestern University urology professor not involved in the research says the study puts what doctors have known into scientific terms. He adds, "What's nice about the study is that it demonstrates something that sounds logical to be true." Urinary tract infections occur when bacteria sneaks into the bladder from the urethra. Women have shorter urethras than men, making it easier for bacteria to get in the bladder and putting women at increased risk for infection. Hooton says although it's simplistic, drinking a lot of water helps flush out the bacteria that can cause an infection. "You're basically clearing bacteria out of the bladder," he explains, as well as reducing the concentration of bacteria in the urine. These two effects reduce the ability of the bacteria to stick to bladder cells, which is thought to cause infection, he adds. If you end up with a urinary tract infection despite adding water and maybe cranberry juice to your diet, antibiotics can usually treat it. But the World Health Organization has warned that some types of bacteria commonly causing these infections is becoming resistant to antibiotics. The more you take antibiotics, the more likely bacteria in your body will become resistant to those drugs. It's not uncommon to get UTIs multiple times, so the issue of antibiotic resistance is especially risky with this kind of infection. Last year, U.S. scientists found a UTI-causing germ in a Pennsylvania woman that didn't respond to an antibiotic commonly used as a last resort. So, how much water should you drink to ward off urinary tract infections? Hooton says because they only looked at a 1.5 liter increase, he can't say exactly. And while "it seems likely that any increase in hydration would have a beneficial effect" for everyone, Hooton says, the study specifically focuses on women who get three or more urinary tract infections a year. "On the other hand, we see no downside to advising more fluid intake in healthy women with UTI recurrences, and we would certainly want to advise them to drink more fluids in our counseling to try this as well as other things to avoid antimicrobials," he tells Shots in an email. Greta Jochem is an NPR science desk intern. Find her on Twitter @greta_h_jochem.